OpenStreetMap is a wikipedia-like project to create a free map of the entire world, open to contributions from anyone. 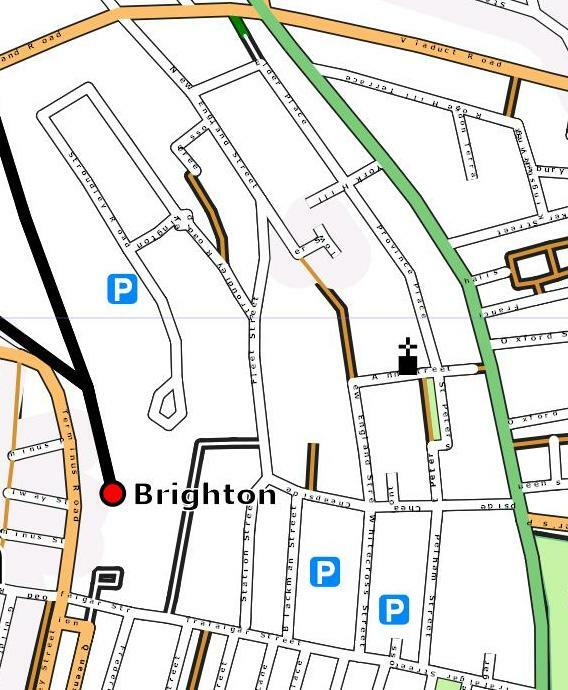 Myself, Chris Corbin, and many others are working on OpenStreetMap in Brighton, and aim to complete the map this spring. We go out with GPS units, walk the roads, collect traces of where we’ve been, and use our software to build the map. 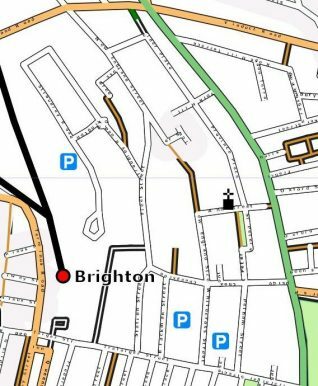 One of the best things about doing OpenStreetMap is discovering all the hidden details of Brighton, the places off the beaten track. My Brighton and Hove has added a lot of history and color to our explorations. OpenStreetMap is the first mapping organization to produce a map of the ‘new’ New England Quarter. The New England quarter is the largest redevelopment currently in Brighton, transforming the disused yards into housing, schools and businesses. nostuff has lots of detailed photos of the work. There are new roads, like Stroudely Road leading to the station, and Kingscote Way, a pedestrian lane through new housing. The Ordnance Survey has not yet collected, redrawn and distributed these new developments, and probably won’t for a year or two. Google Maps and Multimap will be even longer. Right now, OpenStreetMap shows that New England Road is closed for construction, and the new paved pedestrian path from Cross Street…and we’ll be keeping a close eye on changes to keep OpenStreetMap up to date. There’s a great feeling to being the first mapper in a place, a new exploration and discovery…right in the middle of Brighton! It’s more than fitting that one of the new roads on this site will be named after William Stroudely (1833-1889) one of the greatest of the Victorian railway engineers who was appointed superintendent of the Brighton Locomotive Works in 1870. He died at the Paris Exhibition where he was exhibiting one of his Brighton-built locomotives. So far so good, but ‘Kingscote Way’? Oh dear. Why not name the other roads after Brighton Works superintendents? It is interesting that this project should be called ‘the New England Quarter’, as I live in the actual New England, the State of Rhode Island in the U.S.A. I have been exploring this site because I plan to visit some friends who live in Portslade Village later this year. I needed a good idea where the village is located in relation to Brighton. I’ve been able to locate my friends’ street on the street map. The pictures look charming and I am looking forward to actually seeing the area. Editor’s note: Be sure to post a comment on the site when you visit Roxanne – we would be interested to hear your views on the area. There is a road in the New England Quarter named after Robert Billinton. A hundred years ago, he was the Locomotive, Carriage and Wagon Superintendent of the London, Brighton & South Coast Railway workshops in Brighton. Wouldn’t this area have been an ideal site for a sports arena and complex? Far better than tearing up the land at Falmer and catering to only one sport. A world class facility could have done a lot for the town – football, rugby, athletics with auxiliary facilities for other activities – gymnastics, ice skating, fencing, boxing, cycling and ,yes, even another swimming pool. Transportation facilities provided by train and bus already in situ. But I feel the Council and possibly the mentality of the townspeople isn’t up to this type of project. Admittedly an in retrospect comment. There’s no harm in someone with initiative ‘making a buck’ even if the town has to upfront some of the financing but history would indicate a very non-progressive attitude that could be termed the Brighton malaise. A great shame. Is the map of the New England quarter available to download, or a hard copy to photocopy as we are always needing to direct our clients to Fleet St (the BMECP resource centre) and there are no maps available?